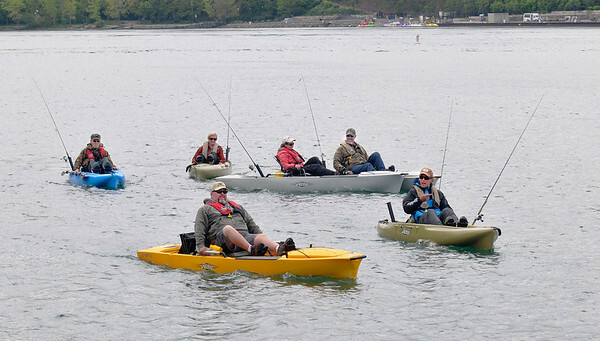 James Neiss/staff photographerLewiston, NY - Representatives from the Hobie Cat Company take a group of visiting outdoor writers on a fishing trip in the new Mirage Pro Angler boat featuring Miragedrive foot propulsion. Members of the Association of Great Lakes Outdoor Writers are in Lewiston attending the 2012 Spring Mega Media Cast & Blast, hosted by the Niagara Convention & Tourism Commission. From left are, writer Dan Small of Wisconson, Ingrid Niehaus of Hobie, Chef Todd Kent of Hartland Outdoor Publications, Lori Smith of CurvesInCamo.com, her husband Mark Smith of Indiana Outdoor News, and Morgan Promitz of Hobie.